William J. Walls Jr. | Parkowski, Guerke & Swayze, P.A. William J Walls Jr., joined the firm in November 2016 after serving 24 years as Judge of the Family Court of the State of Delaware. Before being appointed as judge of the Family Court he was partner in the Dover law firm of Hindman and Walls. He served ten years as attorney to the Delaware State Senate, having held the position of senior attorney to the majority caucus. He has served as City Solicitor to the City of Harrington, Town of Bowers, and Town of Frederica. Prior to entering private practice, he served as Deputy Attorney General, Criminal Division, State of Delaware. He is a member of the Delaware State Bar Association, where he is a member of their family law and alternative dispute resolution sections. He is a member of the National Conference of Juvenile and Family Court Judges. 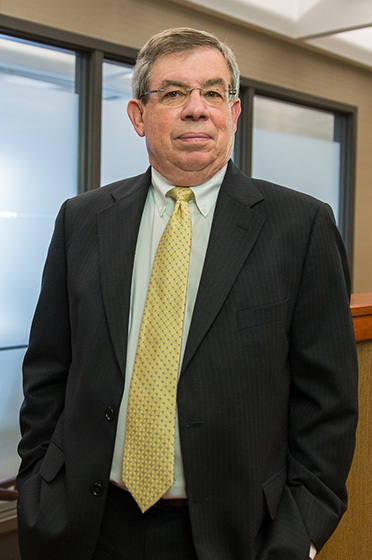 He has served as a member of the State of Delaware Family Law Commission, and Family Court Judicial Council. He has also served on various Delaware Supreme Court committees, including Judicial Education, Judicial Ethics and Permanent Advisory Committee on the Uniform Rules of Evidence. In the community, he was vice president of the Delmarva Council, Boy Scouts of America, president of the Milford Lions Club, and is a 32nd degree mason.